At last year’s Mount Baker Design Fest, the community focused on the topic of Design For Equity. One of the questions focused on the aged pedestrian overpass that winds up and over the Rainier and MLK intersection: Can government-built structures like bridges provide a canvas for social equity? 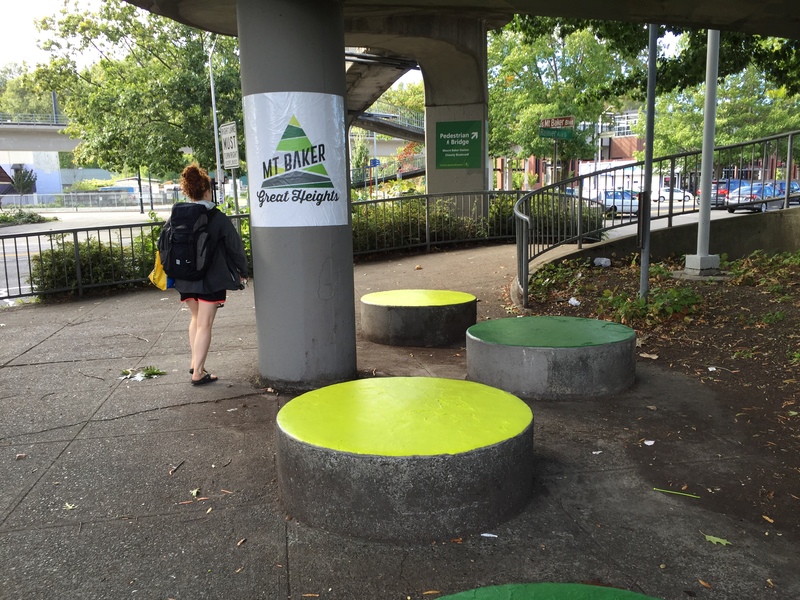 Local Seattle designers took on this question by activating the Mount Baker pedestrian overpass with an installation for the 2015 Seattle Design Festival: Design for Equity. The installation, “Mind the Gap,” explored a literal bridge connecting historic Mount Baker to dense urban development taking place in the North Rainier Valley. The effort addresses equity gaps in accessibility, infrastructure, and culture that frequently follow transit-oriented development in historic neighborhoods, by creating a sense of place through little-known and culturally diverse local history. The result inspired cohesive community ownership on a deeper level. The 40-year old Mount Baker pedestrian overpass, spanning the crossroads of Martin Luther King Jr. Way South and Rainier Avenue South in the Mount Baker neighborhood, is a bridge connecting cultures and resources. The Seattle Design Festival provided an opportunity for local design firms, JeppsonEGD and Penniless Projects, to temporarily transform the bridge into a venue that engages the community with inclusive stories uncovered during the recent “Mount Baker: Great Heights” neighborhood identity project. Today’s urban village has been the stage for some of Seattle’s greatest moments and most profound heroes. Historically, this area is underpinned by the Olmstead plan for interconnected parks and boulevards intended to connect economically and culturally-diverse citizens from Beacon Hill to Mount Baker, and throughout the Rainier Valley. This area was home to two legendary baseball stadiums, beautiful Franklin High School, and extraordinary individuals that made an impact on the world regardless of cultural background or personal challenges. These powerful, inspiring stories were the core of the 2015 installation. 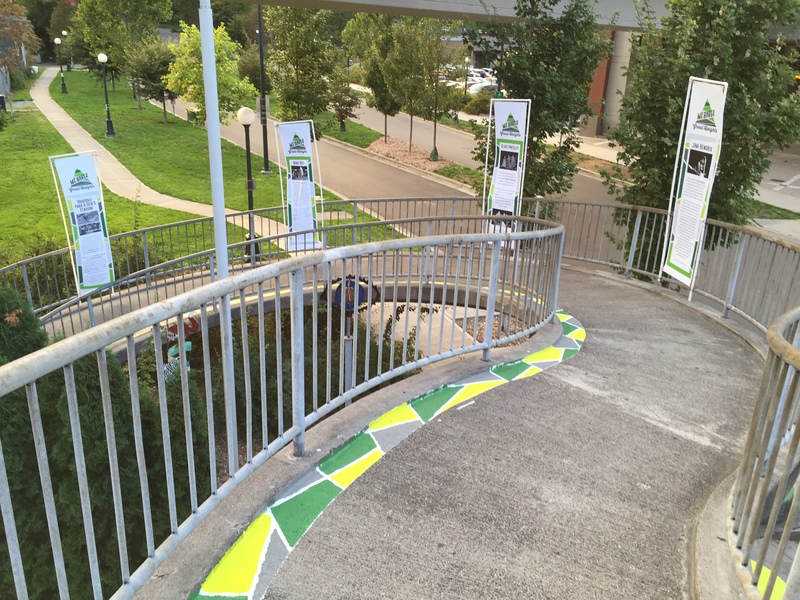 Colorful wayfinding signage welcomed pedestrians and cyclists onto the bridge, reinforcing the Olmsted legacy connections. 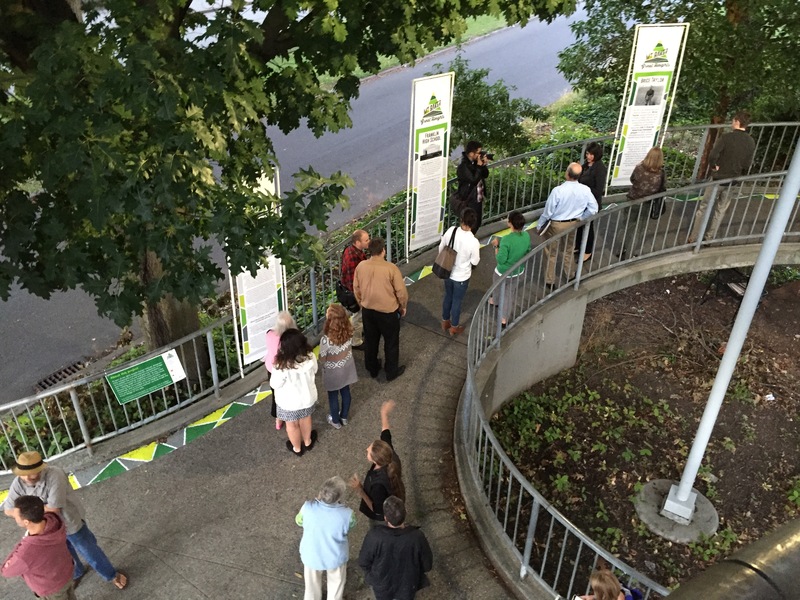 As students, commuters, and recreational users ascended the spiraling ramps, vibrant banners formed an outdoor gallery of inspirational neighborhood stories. All that cross were encouraged to read the stories and consider how they — as community members — can also help shape the future design of this dynamic area. A related Seattle Design Festival panel discussion on local opportunities and challenges for equitable design occurred on September 21st. The panel included representatives from Southeast Effective Development (SEED), Friends of Mount Baker Town Center, Mount Baker Center for the Arts, Friends of Seattle’s Olmsted Parks, Seattle Department of Transportation, and community-oriented design firm Penniless Projects. “Mind the Gap” was on public display through October 3, 2015. The inspiring banners would be on display again in 2016, during the Mount Baker Hub Fest — September 18 and 19. “Mind the Gap” was organized by JeppsonEGD and Penniless Projects. Sponsored by JeppsonEGD, Penniless Projects, Beacon Hill Merchants Association, with support from Friends of Mount Baker Town Center, Seattle Parks Foundation, and Artspace Mt. Baker Lofts. The project was made possible with partial funding by the Seattle Office of Arts & Culture and Seattle Department of Transportation Safe Routes to School. The Seattle Design Festival features tours, exhibits, outdoor installations, activities, films, presentations, and more. The 2015 theme, Design for Equity, created pause and reflection. What is equity? What is equitable design? How do we know that a design is equitable? Is it process or product or both? It stretches across sectors – social justice, urban planning, ecology, and finance to name a few – and brings up ideas of dialogue, form, transparency, access, inclusion and investment. Design for Equity challenges us to question our biases and assumptions and inspire us to work toward ensuring that everyone in our society – from every background, ability, race, age, gender, location or economic status – can access the same opportunities and outcomes, both now and in the future. The stories featured in “Mind the Gap” were uncovered during the “Mount Baker: Great Heights” neighborhood identity project funded by a Federal Community Conerstones grant, in conjunction with the Seattle Office of Economic Development Only In Seattle program with facilitation from SEED and SEEDArts. This project included participation by community, resident, alumni, and business stakeholders, via interviews and focus groups, as well as a comprehensive historical survey. The end product was a local map that highlights local amenities, businesses, and compelling, inclusive history. This design work is the inspiration for the story banners and additional decoration and wayfinding on the bridge.